Here the Electromagnetic wave cuts across the sensor and due to this RF current are produced in the sensor circuitry. This type of EMI tends to interfere with the reception of desired signals or that produces undesirable responses in the electronic system. This can affect the normal reading of sensors. The schematic representation is shown in figure. It occurs due to breakage in the shielding. 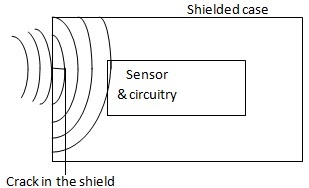 Even though we use shields, the EMI will enter the sensor circuit through breaks in the shielding. So if the shielding is not perfect, even the shielded devices are not immune from EMI. So the leakage can produce radiated EMI, which is caused by induction without the contact with the conductor. EMI leakage between the mating surfaces at the joints and seams is a primary issue connected with the EMI shield designers. Conduction EMI occurs when a signal induces current into the exposed cable. So EMI can travel through this cable and can cause conducted EMI. It mainly occurs due to the breaks in insulation layer of cables. 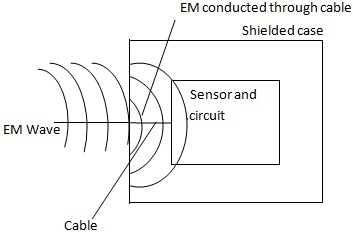 In this type of interference, The EMI signal entered inside the shielded cabinet can cause RF currents which in turn lead to measurement imperfections. For low frequencies, EMI is caused due to conduction. Due to conduction EMI, the EM field around the conductor is no longer evenly circulated and causes skin effect. The conducted noise is further divided into differential noise and common mode noise. Differential mode noise flows in both directions along the line and neutral wires whereas common mode noise flows between one line and the ground. The conducted EMI can have an effect on the function of operational amplifiers even when the frequency is well above the working frequency range of amplifier. 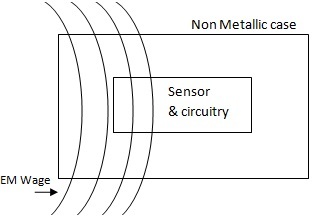 So advanced techniques such as computerized conducted EMI filter design are used widely to prevent its effect on biomedical sensors.